Posted on February 17, 2016	by Blowhard, Esq. 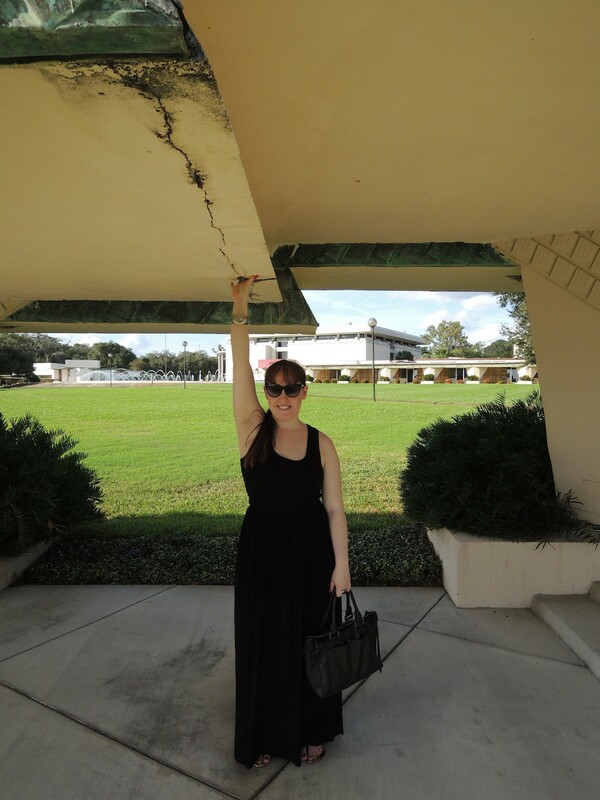 This blurb reminded me that I’ve been meaning to post a few photos of my brief visit to Frank Lloyd Wright’s “Child of the Sun” buildings at Florida Southern College in Lakeland, Florida. The city boasts that FSC is the world’s largest single-site collection of Wright architecture. 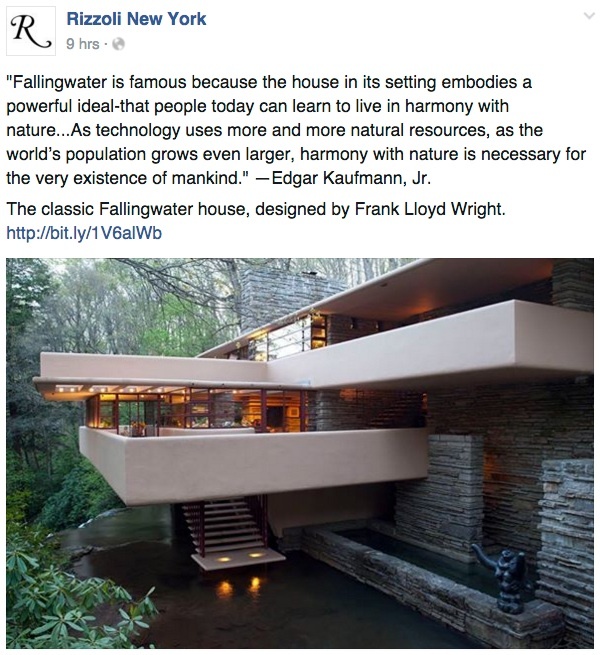 Wright got the commission after the then-chancellor of FSC saw Fallingwater on the cover of Time magazine. As the first picture shows, Wright complied by giving FSC its own riff on the famous Kaufmann house. Let’s zoom in on that covered walkway. As for the art and moral values his work is celebrated for — openness, naturalness, a casual, flowing informality — well, let’s see. His ceilings are often very low — uncomfortably low. Why? Because he was a vindictive short man who was resentful of taller people, and he liked ceiling heights that make tall people feel uneasy. …And those long horizontal lines which we’re told are such eloquent reflections of the American landscape and psyche? Well, they collect water and leak, and the water drips down into the walls, and …. The lovely lady pictured above, who stands at 5’4″, can’t reach the top shelf of her kitchen cabinets but she had no problem touching that walkway ceiling. I’m 5’9″ and even I found the ceiling too low. It rains a lot in central Florida, so I’m guessing these walkways have a lot of unhappy users. And notice also how the moisture and humidity aren’t treating that flat concrete very well. Critical explanations make much of how this project fulfills Wright’s vision of “organic architecture,” but the low flat lines, precast concrete blocks, and rigid geometric forms don’t look all that organic to me. Perhaps the Wright buildings are organic with respect to each other, but they’re not terribly organic in relation to the pre-existing campus buildings or the swampy Florida landscape. 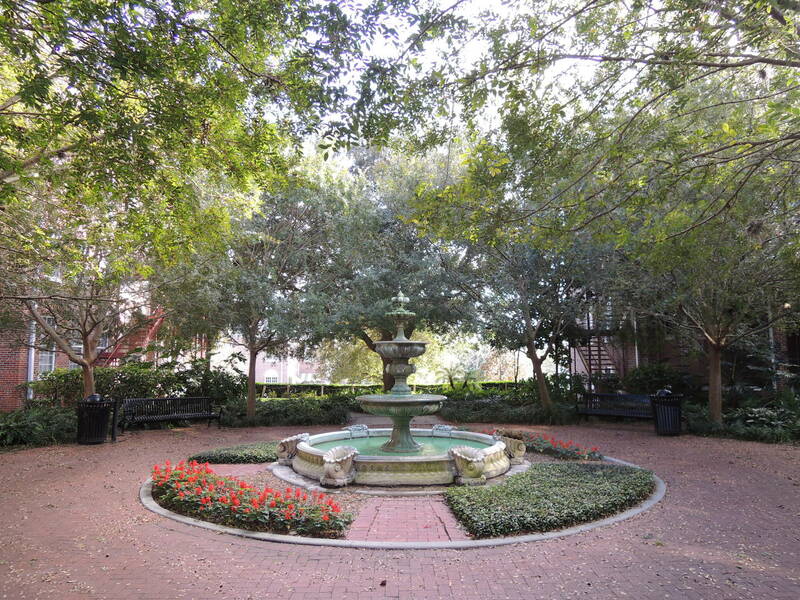 In contrast, this courtyard fountain a few hundred feet away felt more fertile and life-giving. Which reads “Florida” to you more? This entry was posted in Architecture and tagged Florida, Florida Southern College, Frank Lloyd Wright, Lakeland, organic architecture. Bookmark the permalink. I just watched a couple episodes of Stewart Brand’s “How Buildings Learn” on YouTube. He touches on how badly FLW’s buildings hold up over time. It’s a great series so far, right up the alley of this blog’s thoughts on architecture. Christopher Alexander even makes an appearance. It’s from 1997 but the themes are still relevant. Have you seen it? I have not, but definitely sounds like my kind of thing. Thanks for the tip. I have always disliked Frank Lloyd Wrong’s work. Fallingflatter has had buckets of money spent on keeping it intact, and the Marin County Civic Center has had continual maintenance problems. What is the point of modernizing the look of buildings while making them considerably less functional? I quite enjoyed my visit this past summer to several FLW buildings in the Buffalo area. But a lot of his later work leaves me cold. You can see all that abstraction heading in the direction of a soulless modernism. Fallingwater is one I don’t like. The campus you visited looks like more of the same. I have long found it amusing that “modern” architecture like FLW and others who created the idea that flat roofs, thin walls and roofs, large windows, large overhangs are “modern’ when history shows that such building are not what people actually want and need. Large overhangs are structurally weak.